REPLACE YOUR CARPET, OR RESTORE IT? A full restorative commercial carpet cleaning should take place at least once a year to remove the accumulation of soil build up in higher traffic areas within your facility. Soil is the natural enemy of carpet. It damages carpet fibres by attaching to sticky residue left behind from things like coffee spills. Without proper cleaning, carpet fibre damage leads to fading, discolouration, matting, fraying and ultimately premature and costly replacement. A regular commercial carpet cleaning maintenance program is ideal to maintain the performance and beauty of your carpet, but an annual full restorative carpet cleaning is advisable to prolong the life of your carpet investment. ServiceMaster Clean of Fredericton uses cleaning methods and products that have been tested and refined over our over 65 years in the commercial cleaning business. We can provide a commercial carpet cleaning program that is right for your business, and your budget. WE USE ENVIRONMENTALLY SAFE PRODUCTS. All of our commercial carpet restoration, cleaning and maintenance programs use our specialized equipment and proprietary environmentally safe GreenFOR® products. Our cleaning methods follow the guidelines and practices of the IICRC and of carpet manufacturers, and our equipment and products are also CRI approved. COMPLETE OUR FORM TO SET UP AN APPOINTMENT FOR CARPET CLEANING. When will I be able to walk on the carpet after it has been cleaned? This depends on whether a low-moisture encapsulation or a deep clean of your carpet has been applied. However, a general rule of thumb is to allow a drying time of six to eight hours before you can walk on your carpet. 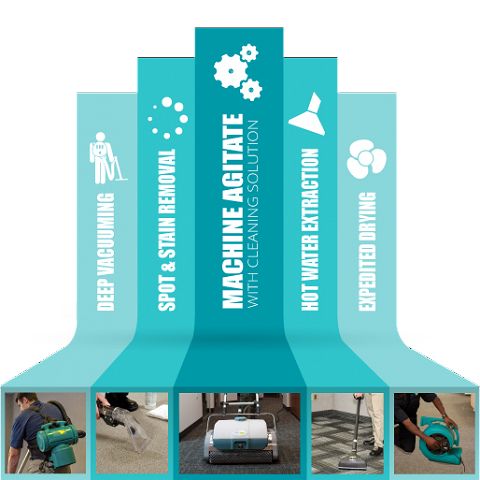 Will carpet cleaning be disruptive to my business? The team at ServiceMaster Clean of Fredericton will work with you to schedule a suitable time, typically after hours. In the event that it is unfeasible to clean the entire area in one visit, we will develop a customized program to clean your carpets in sections. Our technician will also inform you of estimated dry times needed. Are there instructions to follow after my carpets are cleaned? Immediately after cleaning, it’s best to allow carpets to dry for 6-8 hours before walking on them. Walking on them may flatten the fibers. Use air movers if needed to help air circulation as this will speed up the drying time. If a carpet protector such as ScotchgardTM was applied, foot traffic should be minimized for up to 24 hours to let the product cure. Don’t move any furniture back in place until carpet is completely dry or the Scotchgard carpet protector has cured.